The high cost of success. Most people have a desire to improve and grow. To be good at one thing, many things, or to be the best in the world. We often read about incredible human performances on the sporting field and sometimes the business world. However, it seems many of us are missing out on the critical ingredients that are proven to and which could increase your results. And there is a high cost of success. Many years ago, while attending a personal development course, I distinctly remember hearing that it takes around 10,000 hours of practice to become an expert in one’s chosen arena. This 10,000 hour was popularised by Malcolm Gladwell in his 2008 book Outliers. An “outlier” is anyone or anything that lies far outside the normal range. In business, an outlier is a person dramatically more or less successful than the majority. Yippee, I thought. I am nearly there! From that moment I started logging my hours as if this was the magic number to aim for. While I hit this number many years ago concerning coaching and yes, I do believe, humbly that I am a great coach, I know that I can always do better. However, for other areas of my life, I was still mystified as to why I never quite achieved the level of expertise I desired. I never mastered French or the piano to the degree I wanted. Cooking and gardening certainly require more practice! While researching strategies from Performance Psychology to help my clients results, I discovered that there was a specific science for achieving. That science comes in the form of deliberate, purposeful goal-oriented practice. While most of us know that talent is highly overrated and that you can indeed do anything, there is a significant investment to using this science successfully. There is a high cost of success. Deliberate practice is focused, consistent, goal-oriented training. It favours quality over quantity. It knows not all practice is created equal. This is where we let ourselves down. Not everyone is willing to pay the price for what it takes to become an expert or to be hugely successful. According to Ericsson, becoming an expert in something isn’t just a matter of clocking up thousands of hours. What distinguishes a virtuoso violinist or an Olympic athlete from the rest of us is how they spend these hours. Of course, when it comes down to sports, genes and starting early can certainly help! 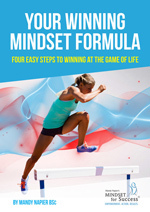 However, for business success, or even personal success, here are seven ingredients that when used will ensure you increase your success and raise the bar. You must have specific, well-defined goals. You must know precisely what you want to accomplish. Then you must break every step of the process into small components, ideally based on how experts do it. The precise reason why most elite athletes have at least one coach and work on particular areas of their performance. Reviewing, revising, modifying goals incrementally as they progress. This is called smart practice as against what most of us do in our businesses, naive practice. You need intense focus. You must be intentional and deliberate with your actions. Critically important in a world where our attention span has fallen so dramatically and has been compared to that of a goldfish! What’s this, you say? Yes, a goldfish has nine seconds attention span, and ours allegedly is eight seconds. How often do you just go through your day without being focused and intentional? Without setting a specific goal or scheduling tasks and sticking to it in a maze of other pressing duties and obligations? Unless you are wildly successful at this, you will probably require someone to help you. You must get out of your comfort zone. And we don’t like that one, do we? Pushing ourselves to do things we’re not proficient at goes against our innate desire to keep safe and comfortable. It takes determination, grit, digging deep, and a focused mindset to do things that are both new and often not enjoyable, to begin with. A high cost of success. Being open to feedback and making incremental changes is essential. Too often, we take feedback as criticism. However, feedback has been said to be the ‘breakfast of champions.’ Over time, self-correcting and adjusting will become the norm as a new habit is created. Mental practice is essential and a big part of deliberate practice. This is probably the most important practice when it comes to the difference between winning a gold or silver medal. Research has clearly shown how mental rehearsal improves performance as your body responds in a similar way to actual practice. It becomes a powerful catalyst for creating new neural pathways and new results. Yet it is perhaps one of the most underused methods outside the world of sports. Deliberately creating mental pictures and practising seeing yourself doing the task in your mind takes effort and consistency. Just imagine what results you could achieve if you consciously mentally rehearsed your meetings, negotiations or sales calls in advance? You must learn to love repetition and sameness. This is where a bit of brain hacking comes in. Our brain loves variety and distractions. It is motivated to move toward pleasure and away from pain. Deliberate practice consists of taking previously learned skills, breaking down each component, modifying and practising again. To our brains, this may be hard and tedious. Imagine breaking down each step of a sales process or negotiation strategy? Rehearsing precisely what you will say and how you will say it. Recording it, pulling it apart and practising again. Do you think your results might improve exponentially? You must have a big ‘Why’ for your activity. A genuine deep desire to get great at what you are doing. An athlete wanting to get to the Olympics has a big ‘Why.’ You must find yours in your business. Without it, the odds of keeping focused and avoiding distractions are stacked against you. Create space and fixed time to practice – one that is clear of distractions and obligations. Limit practice sessions to no more than an hour at a time. Schedule your practice into your diary to raise its importance in a sea of overwhelming to-do lists. Start small and set things up so you are continually seeing concrete signs of improvement. Small wins create more significant momentum and help maintain consistency. Surround yourself with like-minded people—people who believe in you and what you’re doing. This may mean stepping outside your current circle of contacts and venturing into new territory. Most importantly believe in yourself. Because if you don’t, you will never achieve the level of success or expertise you desire. This is where a good coach can help you bring out the best in yourself. Here’s to your future success. The only question to ask is are you willing to pay the high cost of success? If so, here’s to your deliberate, purposeful goal orientated practice and becoming the expert in your business or chosen field. Ultimately the high price of success may indeed be one of the greatest investments you ever make. Mandy Napier is dedicated to working with high achievers and individuals to help them clear their current blocks, manage overwhelm and avoid meltdown. To even out all areas of their lives, achieve their potential and perform optimally. As an authentic, and inspirational Global Mindset & Performance Coach and Speaker, she partners with professionals and teams to create transformations and lasting results. Subscribe to my YouTube Channel for weekly videos.